Summary: A pilot tries to save a plane from crashing. Review: “Flight” is not a perfect movie and is far from that achievement but certainly has the power to hold your attention. An experienced pilot with alcohol problems, despite the deed of saving most of the passengers from a plane crash, starts a tough journey to be sober and clean his name from any responsibility in the accident. The process will be long, with ups and downs, lies, pain and guilt, but only he can help himself. Despite some avoidable scenes, mostly in the final moments, Zemeckis guarantees another good quality Blockbuster, many years after “Back To The Future” and “Forrest Gump”. 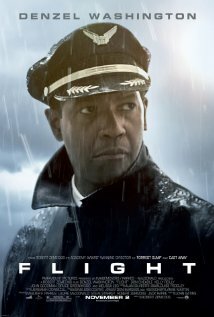 Denzel Washington, Kelly Reilly and John Goodman, the latter with two fantastic appearances, helped to make"Flight" memorable.